Trail follows freeway for about a mile before beginning a grueling 15 switchback climb where the trail kinda levels off for a mile or so. Then things begin to get steep again to about 4000'. 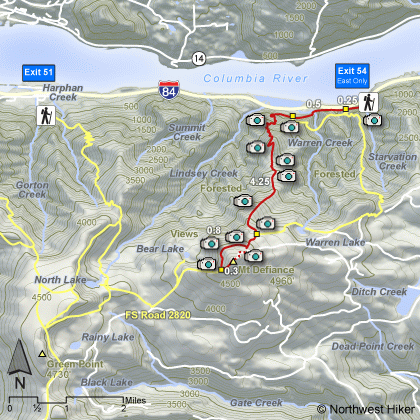 Within a mile of the top you have the opportunity to take a loop trail the west of the summit and approach the top from the south side. Return down the north side and meet up with the trail you came up on. Traveling west on I-84, you'll continue past Exit #55 to Exit #51/Wyeth and come back east. 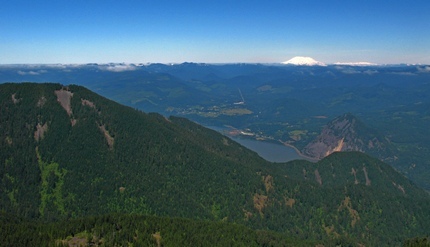 The Starvation Ridge and Mt. Defiance trails begin at the west end of the parking lot by walking alongside the freeway. Starvation Creek Falls is east of the restrooms.